I am Bill Hunter, an avid hiker. For hiking related articles, see the following: A Thrilling Trek to the Key Hole on Longs Peak An Exhilarating Hike to Scenic Hallet Peak Best Hike for Kids in Rocky Mountain National Park Love to write too? Join me on here on InfoBarrel. Are you looking for a wholesome, outdoorsy family vacation in an idyllic place that is affordable and ideal for kids of all ages, but does not involve camping? You should seriously consider the YMCA of the Rockies. This vacation spot is perfect if you want an affordable, activity-filled, family vacation that supports quality family time. Here is some essential information about what you can expect when you visit. The YMCA is in a valley on the eastern border of Rocky Mountain National Park, and is surrounded by snow-covered mountain peaks. A lush, green lawn marks the center of the camp, which is a popular grazing place for elk, depending on the season. Humans use the lawn for soccer, softball, tag football, volleyball, and kite flying. Estes Park, the nearest main city, is a 15 minute drive. Estes Park is a quaint mountain town, which itself is worth a day trip. It has a main street that will please the shoppers in the family and the oldest operating movie theatre in the country, the Historic Park Theatre. If you don't have a car, take the free local shuttle from the YMCA to Estes Park. You might be surrounded by nature, but you don't have to rough it. The YMCA cabins might be basic, but they are cozy and they have electricity, central heat, bathrooms, and fully equipped kitchens. They also have motel rooms, and larger cabins for big groups. To save money on food, you can buy groceries at the Safeway in Estes Park on the way to the YMCA. Otherwise, you can eat your meals at the YMCA cafeteria or at a small café that serves breakfast and lunch. For our family, the lack of televisions in the cabins is a huge plus. With no television to distract us, we spend much of our time together, playing games, reading, doing arts and crafts, or participating in organized group activities. The YMCA also has many board games, books, and sports equipment that you can check out for free during your stay. You can also rent bicycles. If you like mountain biking and are fit enough to ride up steep hills, ask about the single track mountain bike trail that runs along the river. A weekly newsletter describes the organized activities. They have educational or craft activities for very small children, family scavenger hunts, guided nature hikes, putt-putt golf, and even zip lines, archery, and rock wall climbing for older kids and adults. The YMCA also has an extensive crafts center, where you can spend hours or even days creating intricate tile mosaics, painting ceramics, or making tie dye clothing. Don't miss the nightly Bingo. You can win coupons for free brownies and hot drinks at the cafe. The bird banding demonstration is also a must see. The YMCA is minutes from Rocky National Park, a hiking mecca. Take advantage of the YMCA group hikes led by master hikers. You can choose from all day treks above the tree line to gentler, shorter hikes for families. In particular, the Emerald Lake hike in Rocky Mountain National Park is great for introducing kids to hiking. For serious hikers, consider these great hikes. If you are staying at the YMCA, many of the activities are free. The exceptions include the crafts, the zip line, the rock wall, and a few others, such as horseback riding or fishing trips. The lodging is quite affordable when you consider the included extra activities and amenities. If your family is like mine, you can’t go on vacation without a pool. Don’t fret. The YMCA has a large, heated, indoor pool staffed by alert, friendly lifeguards. If you are not a member of the YMCA of the Rockies, you must wait until April, when the reservation system opens, to make reservations for the summer. To make sure you get your desired lodging type and dates, make your reservation online immediately when the reservation system opens, at 12:00 a.m. Be persistent. The website is usually overloaded initially. If you wait until the phone lines open the next morning, you might not get the dates you want, especially if you are going during their busy period, which is from the middle of June through the middle of August. Consider reserving the last week of August, after school has started in Colorado. Making reservations at this time is easier, but the downside is that the YMCA tends to have fewer activities and the day camp for the kids has closed for the season. If you are a member of any YMCA chapter, you get a small lodging discount. Take a taxi or Uber into the west side of Denver and rent a car there. If you are renting a car for a week or longer, you can save a considerable amount of money by taking a taxi or an Uber into Denver and renting a car there. Don’t rent a car. Instead, use a shuttle service to get to Estes Park and then use the free local shuttle system to get around. The disadvantage of this approach is that you won’t have your own transportation while at the YMCA. You must depend on the shuttle, which goes only to Estes Park or Rocky Mountain National Park. From the airport, take Pena Blvd. west. Turn right on Tower Rd. Turn left on E. 120th Ave. Turn left on Highway 66 and follow the signs to Estes Park. 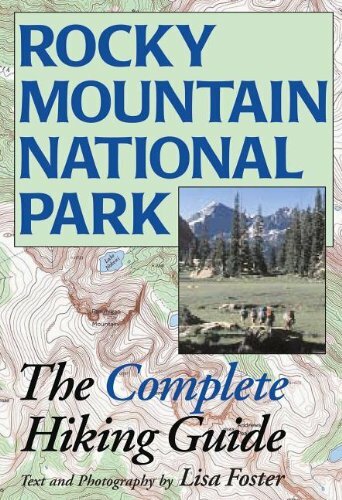 This book is a comprehensive guide to hikes that you could reach easily from the YMCA.